This project is a direct result of my love for Starbucks unsweetened iced green teas and fresh herbs. 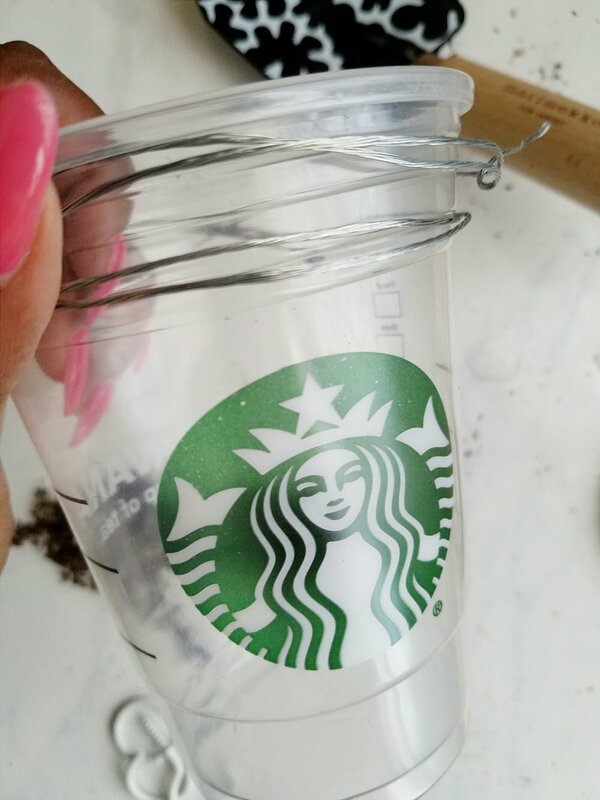 I won't mention how many times I go to a week I go to Starbucks ( enough to reach gold status), but the number of plastic cups that I had accumulated called for some kind of upcycling DIY project. The opportunity presented itself, when I found myself throwing away more than half of the fresh basil, I purchased for a Bolognese recipe and never used again. Although I love cooking with fresh herbs, I always seem to end up with more than I need, resulting in wasted money and produce. In efforts to put an end to my wastefulness I decided to grow my own herb garden and use my Starbucks cups as planters. First, I took a trip to the local nursery,at Anawalt Lumber Yard, where I purchased some Basil and Rosemary seedlings and Miracle Grow Moisture Control potting mix for under $15. The gardening associate told me that the basil would need plenty of sun light, so I decided to hang the herbs by the kitchen window. Since I had spent very little money at the nursery, I decided to stick with the low-budget theme and find materials around the house, to hang my planters. After rummaging through my crafting supplies, I found some picture hanging wire, jute string, and cup hooks leftover from past projects, I now had everything I needed to create my hanging herb garden. Planting: 1. Wash and dry cups. 3. Remove herbs and soil from pot. 4. Take some of the loose soil and place a small layer at the bottom of the cup. 5. Place your herb plant inside of the cup and fill with soil around the plants roots. 2. Take wire from around cup and fold in half. 3. Twist the wire together to form a loop at the folded end. 4. Wrap wire around cup and create another loop at the other end and twist to secure. *Wire should wrap around the cup one full time, resulting in a loop on each side. 6. Cut a piece of jute string to your desired length and tie each end to the wire cup holder loops. 7. After choosing where you want to hang your herbs, create a small hole in the wall using a hammer and nail. 8. Remove the nail and screw in the cup hook. 9. Once the cup hook is secure, hang the plant on the hook and adjust to desired length. 10. Tie a knot around the cup hook and cut excess string. And there you have it! Your very own hanging herb garden! Now just so we're clear, I'm not suggesting that you develop a Starbucks habit like mine, but if you a have some plastic cups just laying around the house,that aren't being used for drinking, this is a great way to put them to use!